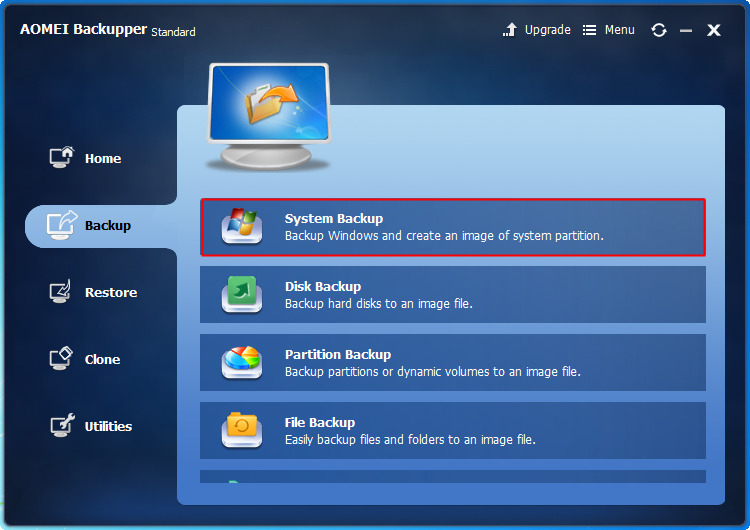 How to Set Up Automatic Backup in Windows 8 and 8.1? Most users will backup Windows 8/8.1 system after a fresh installation. But how to set up an automatic backup in Windows 8/8.1? AOMEI Backupper could be helpful. Backup Windows 8 or Windows 8.1 is a wise choice because it can avoid many troubles. No one will promise you that it won’t get in trouble, not except Windows 8/8.1. The computer may get some errors while it’s working, such as virus attacks, system crashes, hard disk drive broken, or human’s wrong, even natural disaster would make the data loss. Once the data loss, it may make you suffer a big damage. Maybe it’s a report that you are going to deliver to your boss, or the most important information to your company. It will make a big trouble not if you backed up before. Backup can help us get out if those troubles, and this is what backup exact mean to us. However, with time goes by, the data is adding every day. We cannot promise that we can remember to backup the data every day, and backup every day is very annoy. Then, why not setup an automatic backup when you backup Windows 8/8.1 at first? How to Set up Automatic Backup for Windows 8/8.1? Backup Windows 8/8.1 is very simple. We could use Windows 8/8.1 built-in tool File History to backup it. However, to do an automatic backup in a simple way, here we recommend you a third party free backup software - AOMEI Backupper Standard. AOMEI Backupper is designed by a famous software company AOMEI Technology. The Standard version is free, but it is a great powerful software. It can backup Windows 8/8.1 automatically so easy, and it has many other features. What’s more, it supports more than Windows 8/8.1, it supports Windows 10/7/Vista/XP, too. 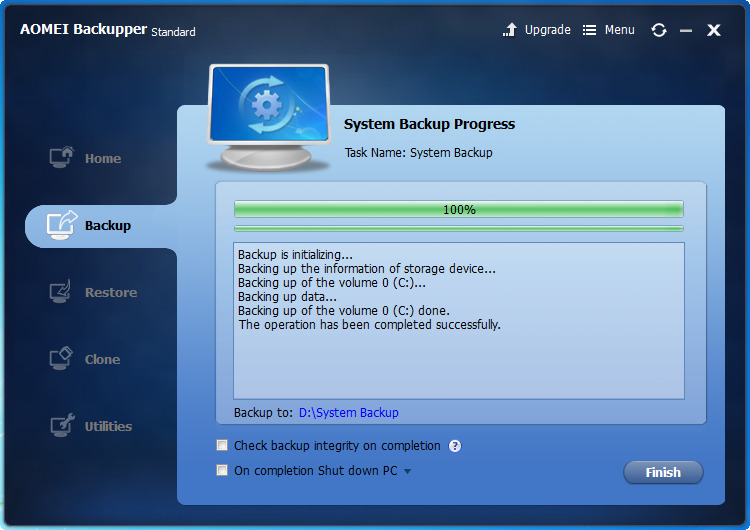 With the help of AOMEI Backupper Standard, to set up an automatic backup for Windows 8/8.1 only needs a few steps. The following instruction will guide you step by step. Step1. Download AOMEI Backupper Standard, install and launch it. 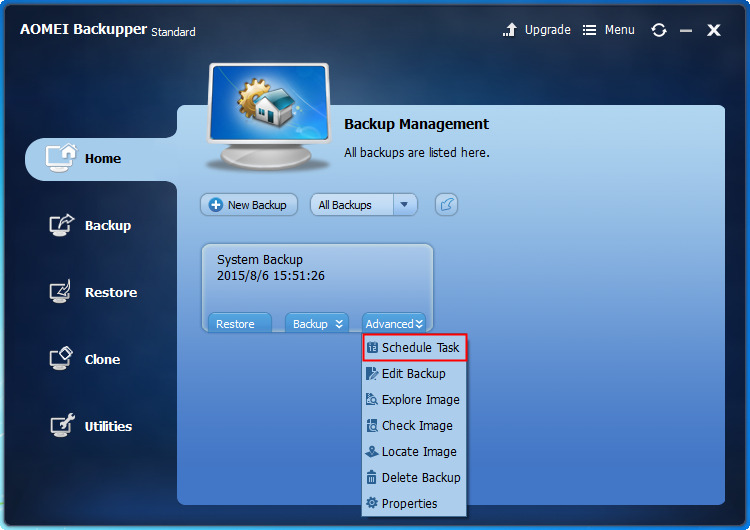 Click Backup and select System Backup. Step2. 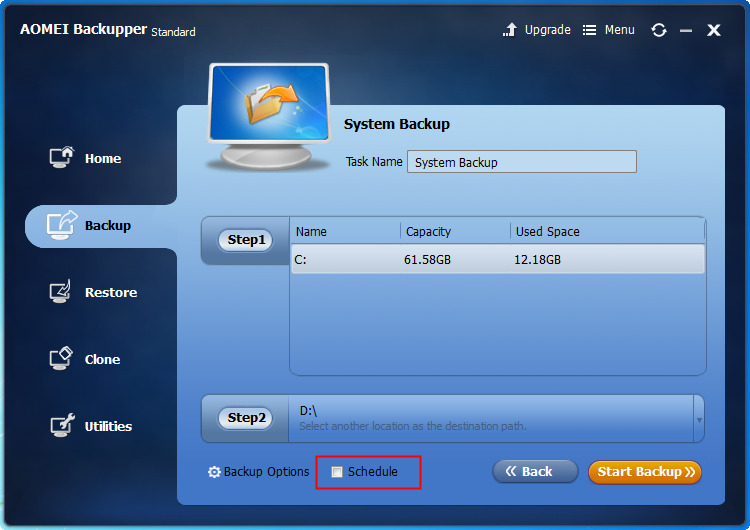 After choose the destination place at the step2, you can click Schedule to open the automatic backup window. Step3. You can see there are two options “General” and “Advanced”. 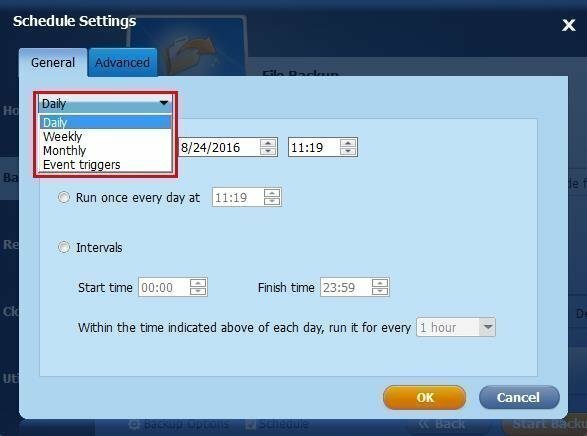 General is for setting automatic backup, you can choose daily, weekly, monthly or event triggers here like the following interface. By the way, you can choose to do the full backup or incremental/differential backup under the Advanced tab. Then, click Start Backup. Step4. After the progress reaches 100%, you can click Finish to end up this program. The Windows 8 automatic backup has been done already. However, if you forget to set up the automatic backup when you backup Windows 8, it doesn’t matter, you can set up automatic backup for it at the Home tab. Select the backup file and you can see three options, “Restore”, “Backup”, “Advanced”. Click “Advanced” and select “Schedule Task”. You will move to the interface of “Schedule Settings” directly. Then, you can set it up under the “General” tab. As you can see, AOMEI Backupper still has many other features, you can use it to restore system, clone, or create a bootable media, etc. It is very helpful.